Is there anything more yummers than chocolate? Nope! We munch our way through tons of the stuff, but have you ever wondered how chocolate is made? 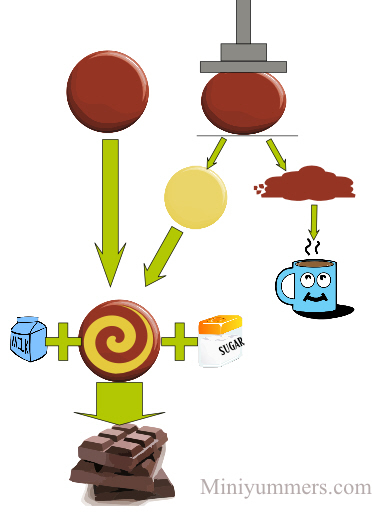 Here is an easy guide to show you how chocolate gets made from the cocoa bean to the bar. 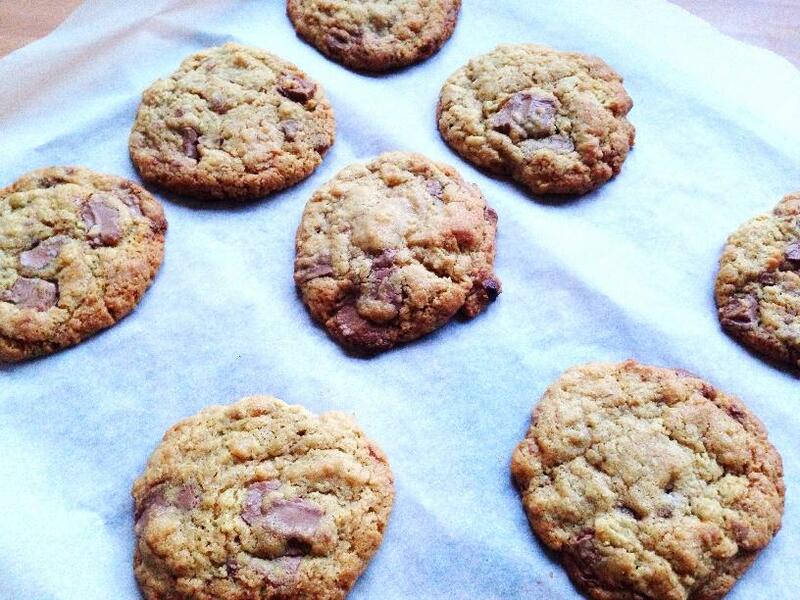 We’ve included a yummy chocolate chip cookie recipe to try too. 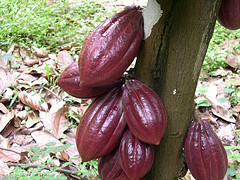 Cocoa pods on the cacao tree get picked when they are a burgundy brown colour–this is when they are ripe. Did You Know? Some Cocoa pods are as big as a rugby ball. 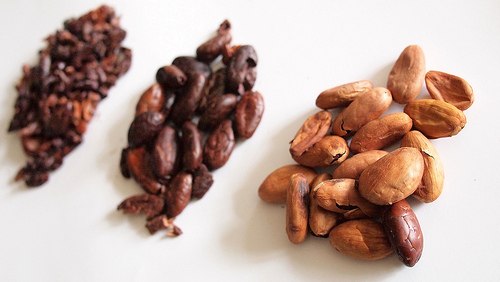 Inside the cocoa pod are between 20-50 seeds–this is what we know as cocoa beans, although they taste pretty sour when first picked and nothing like chocolate. The cocoa beans then go into a box to ferment. Then they are laid out in large trays to dry out in the sun. Then they are sent off to the factories. Once the beans arrive at the factory, they are sifted to get rid of bits that aren’t wanted (grit, dirt, etc) and are then roasted at a low temperature to bring out the chocolate flavour. The outer shells are now cracked open to leave the cocoa nibs that are inside. The cocoa nibs are crushed up and ground into a paste. This paste is called cocoa mass. You could melt the paste at this stage and make a chocolate bar, but it would taste really bitter. Melted cocoa mass is called cocoa liquor. Now, some of our cocoa mass is kept for later, the rest is pressed by a machine which squeezes out the cocoa butter in it. What’s left behind is a pressed powder cake. This is ground up and becomes cocoa powder. The cocoa mass we kept is now mixed with the cocoa butter and sugar is added. Sometimes other ingredients are added too, such as vanilla flavour and milk. Dark/plain chocolate is around 70% cocoa mass and cocoa butter, and 30% sugar. Milk chocolate is around 40% cocoa mass and cocoa butter, 40% sugar, and 20% milk powder. White chocolate is around 49% sugar, 33% cocoa butter, and 18% milk powder–no cocoa mass is used at all. Did you know? The first chocolate bar was created in England in 1847. The blended chocolate then goes through rollers to improve the texture and make it more smooth. The final process is called tempering, where chocolate is heated and then cooled. 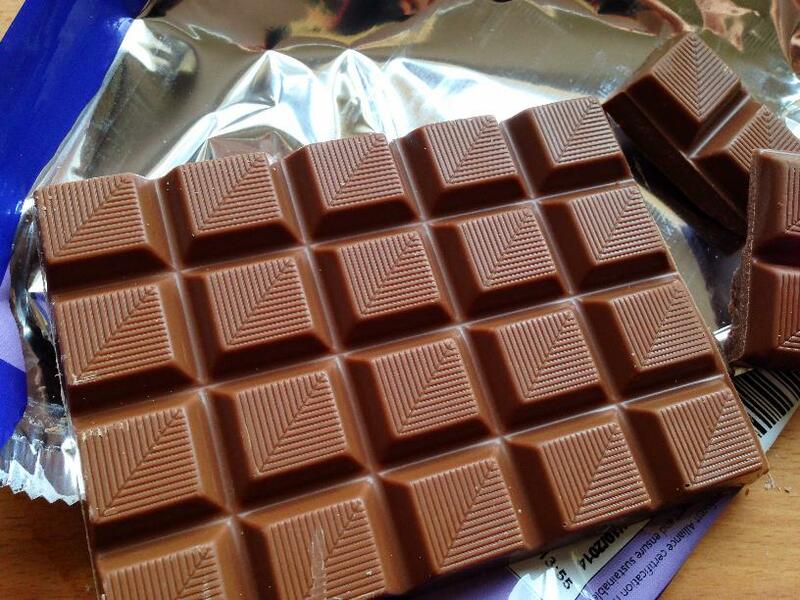 This makes sure the crystal structure in chocolate behaves itself and that chocolate looks nice and shiny when you open the wrapper to your chocolate bar. No one said making chocolate was easy! But fortunately, making chocolate chip cookies is really easy. Preheat oven to 180c, 350f, gas 4 and put greaseproof paper onto 2-3 baking trays (depending on size) if they aren’t nonstick. 1. Put both types of sugar and the butter into a bowl. Beat until it’s nice and creamy. 2. Add the egg and vanilla and mix in well. 3. Sieve the flour and bicarbonate of soda into the bowl and mix with a wooden spoon. Add the chocolate chips and stir until they are spread throughout the mix. 4. 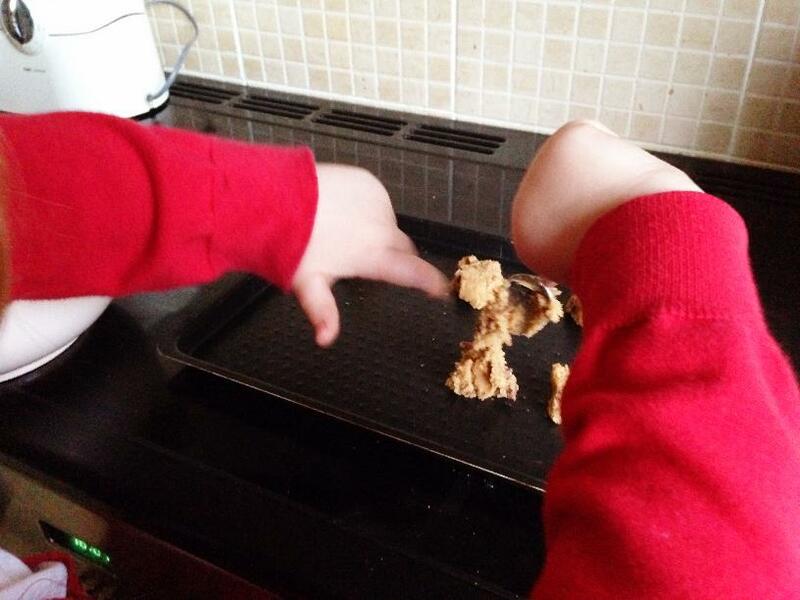 Use a small spoon to blob mounds of the mix onto the baking tray. 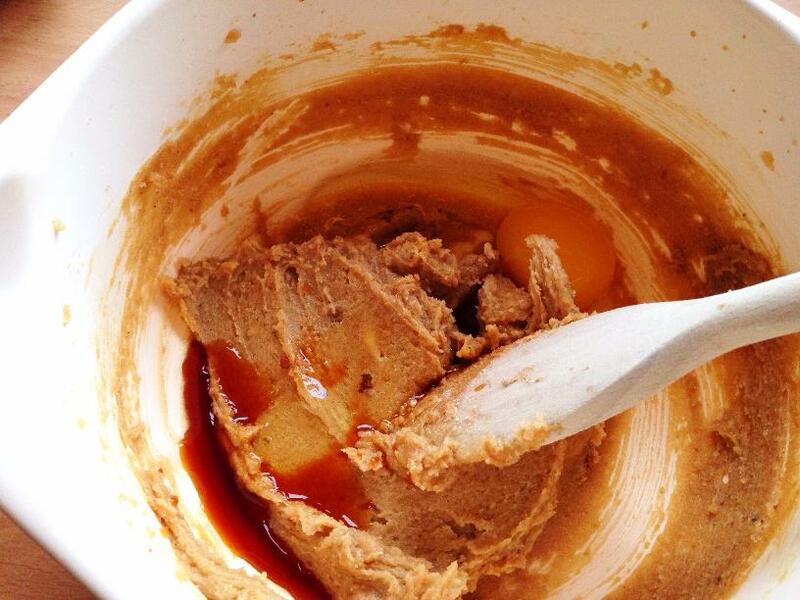 The mix will spread a lot so make sure to leave 5cm between each blob of mix. 5. Bake for 10 minutes. They should be golden around the edge but still a bit soft in the middle. 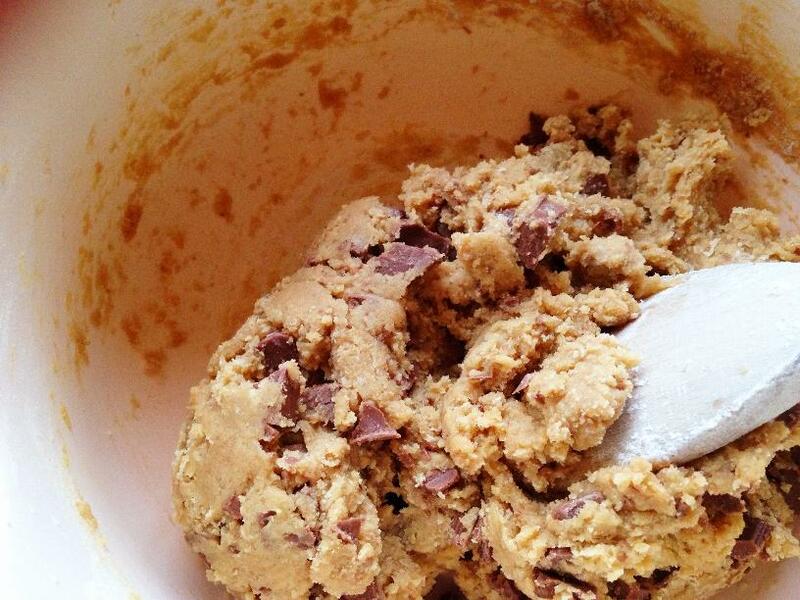 And that is how you make chocolate chip cookies. 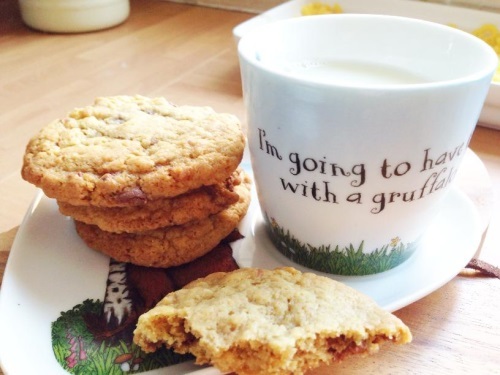 Good enough for eating tea with a Gruffalo, and much easier to make than chocolate itself. What is your favourite type of chocolate? 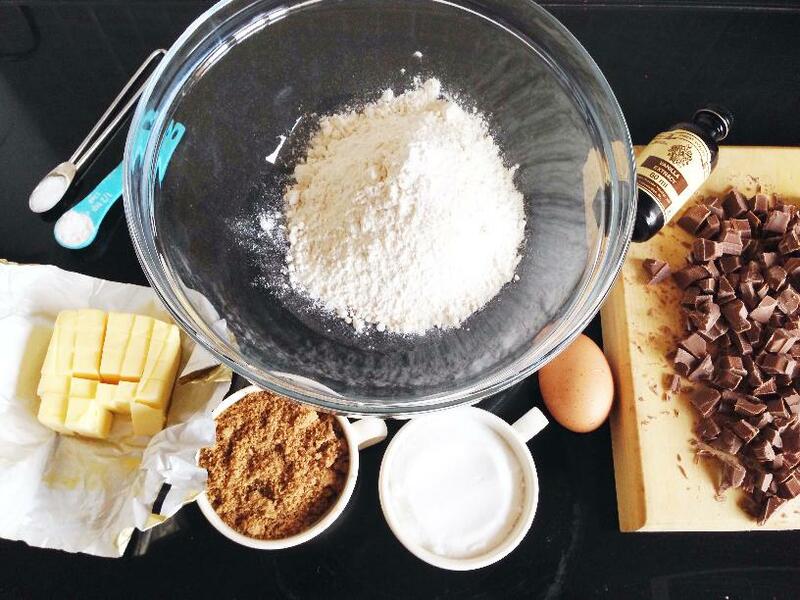 We used milk chocolate to make these cookies but using dark or white would be yummy too. i want to join mini wp_mer’s to show kids how to make food like healthy food and nutrechious foods for kids and teach them to how to make chocolate and the best known foods in the world. I love miniwp_mers.com because I’m learning how to make food and snacks and chocolate from this website and staff of this website for teaching us about food and how to make them for an snack or breakfast or lunch or dinner for our family or the chocolate as a desert every time we eat 3 meals a day.